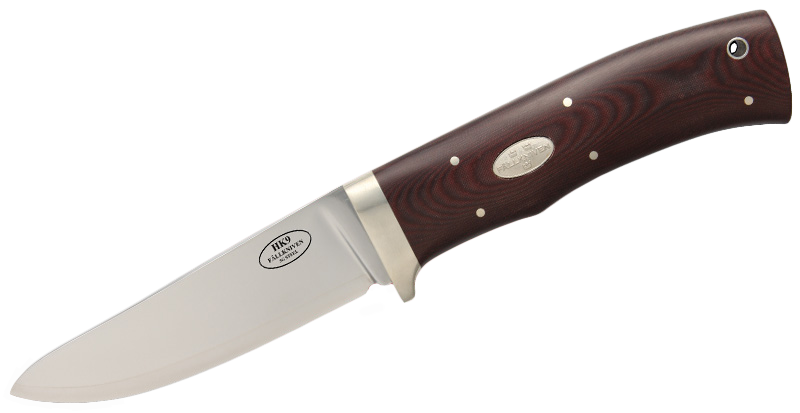 The HK9 is a great knife which can be used in several scenarios but is obviously more suited to hunting and the forest environment. 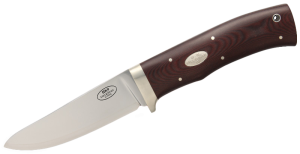 It is actually a hunting knife which is intended for the experienced and highly advanced hunter who has the knowledge where to place the blade on potential prey. However it is also an excellent all round knife which feels solid and sturdy in your hand, is also compact, easy to use and extremely stable. The good thing about this knife is that its appearance deceives since you won’t imagine it performs so well upon first impression. However when you begin using it, you realize that it is really one of the most advanced hunting knives in the world and it feels just right when holding it in your hand. You’ll notice that its performance is out of the ordinary when you begin cutting with it since the extra strong and laminated powder steel manages to keep an edge incredibly well. The HK9 really is a knife to be reckoned in on all counts. What about the knife’s sheath however? 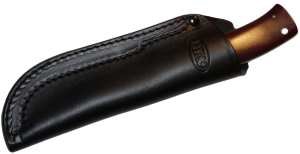 The purposely made black leather sheath for the HK9 is a work of art in itself and is extremely well made. Apart from keeping the knife safe, it comes without any sort of snappers. The sheath’s leather is something like 3mm thick and the sheath is made in such a way that it is sewed with a thick line. Fallkniven believe that the sheath fits as tightly as possible to your belt to enable you to pull out the knife in one fell swoop. The sheath should be cleaned regularly and kept as dry as possible by using some regular shoeshine. Avoid any sorts of grease to clean it since that will soften the leather. There’s also a waterproof option sheath which is the zytel type manufactured especially for the F1 but which can also be used for the HK9.